Thousands of faculty at 24 colleges in Ontario are heading to the picket line in a battle over the explosion of precarious work at Ontario’s college campuses. The 12,000 professors, instructors, counsellors and librarians represented by the Ontario Public Service Employees Union were forced to strike after management rejected a final offer from the union to end systemic job insecurity at Ontario’s colleges. Colleges agree to end their dependence on temporary contract work by adopting a 50:50 ratio between full-time and contract faculty. Colleges agree to increase job security for part-time faculty. Colleges grant academic freedom to faculty, giving them a stronger voice in academic decision-making and protect the integrity of their work. The union’s demands highlight the increasingly insecure working conditions for faculty at Ontario’s colleges and the erosion of quality as the provincial government has reduced funding. According to data from the College Employer Council, part-time contract instructors now make up a staggering 70% of all Ontario college teachers. 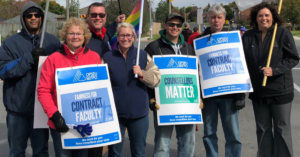 In the last decade alone, the number of part-time contract teachers at Ontario colleges have exploded, growing at more than double the pace of full-time academic staff. Even though they’re doing the same work as full-time faculty, teachers working on contracts are paid well below Canada’s median income earning an average of less than $30,000 per year with no benefits or job security. What’s more, those teachers are usually assigned classes at the last minute with no no time to prepare or meet with students, plus many college teachers in Ontario are forced to overload their teaching schedules or work multiple jobs just to make rent and pay their bills. 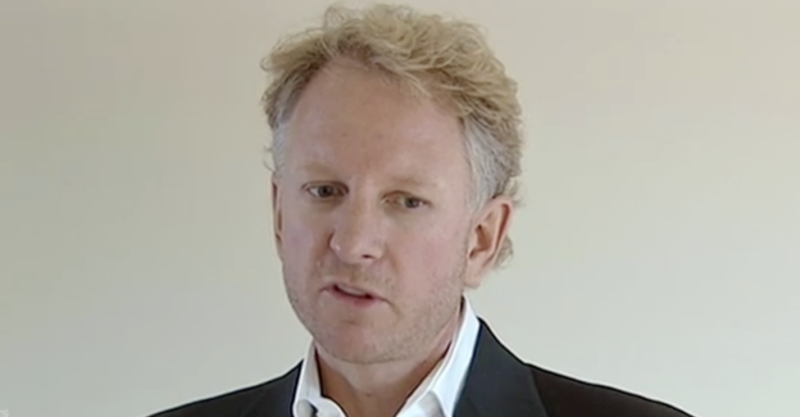 “Course development (some of which I have done from scratch) and maintenance (keeping up with current research) is time consuming, as is marking of tests and assignments, student contact (whether in person or my email), upkeep of online resources, and administrative functions. 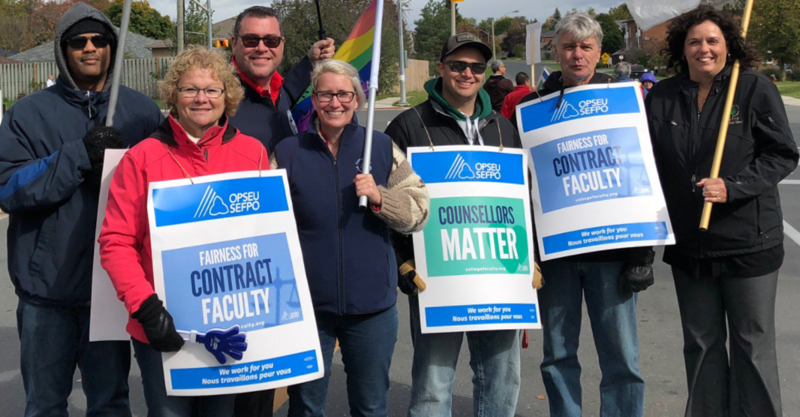 OPSEU points out contract instructors are forced to reapply for the same jobs each semester – regardless of how good they are or how long they’ve taught a course, experience and seniority don’t offer contract faculty a clear path to full-time positions. At the same time as colleges have shifted to part-time contract faculty, the number of students enrolled in college courses has exploded. 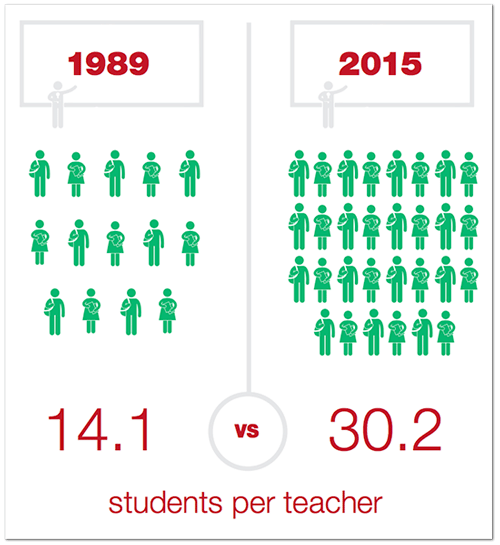 College enrollments have doubled since 1989, yet there are now “roughly 1,000 fewer full-time faculty to teach 100,000 more students” than there were 28 years ago. A Winnipeg-area real estate developer has launched a lawsuit against 49 people who tried to defend ecologically sensitive wetlands that have historical significance to the Métis against controversial development plans.